New Balance is one of the best-known sports brands worldwide. This is also one of the largest manufacturers of footwear, clothes and accessories. The brand specializes primarily in producing jogging footwear. It came to the Polish market in 2000. The chain has seventeen brick-and-mortar stores in various parts of Poland, including three outlets. 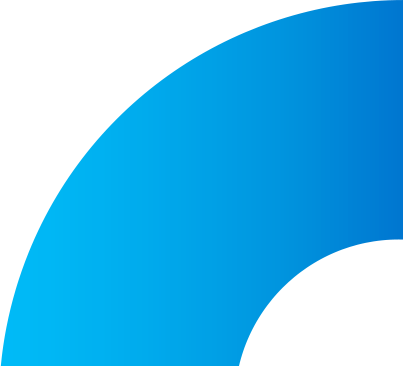 Creating a clear and simple layout compliant with the international key visual of the brand. Designing an e-shop in responsive web design. Creating advanced integration with the warehousing & accounting software Streamsoft Verto. The company has an official key visual used both in the brick-and-mortar stores and in e-stores of the brand. One of the most important tasks when implementing New Balance Poland store was to create a layout resembling the applicable standards visually. Referring to the international key visual of the brand, consistent colours and contents layout on the page was ensured. In its products, New Balance brand focuses primarily on the technology. This is why it was important to place the information on all technology parameters on the product page. The ultimate way of their presentation depends on the decision of the store administrator. S/he can utilize a couple of selected methods, that is a description, video or infographics, or even all three forms at the same time. What makes New Balance store outstanding is the non-standard product presentation. The panoramic photo format was used. Animated “call-to-action” (CTA) buttons were also used. They not only attract attention but are also well received by the users. 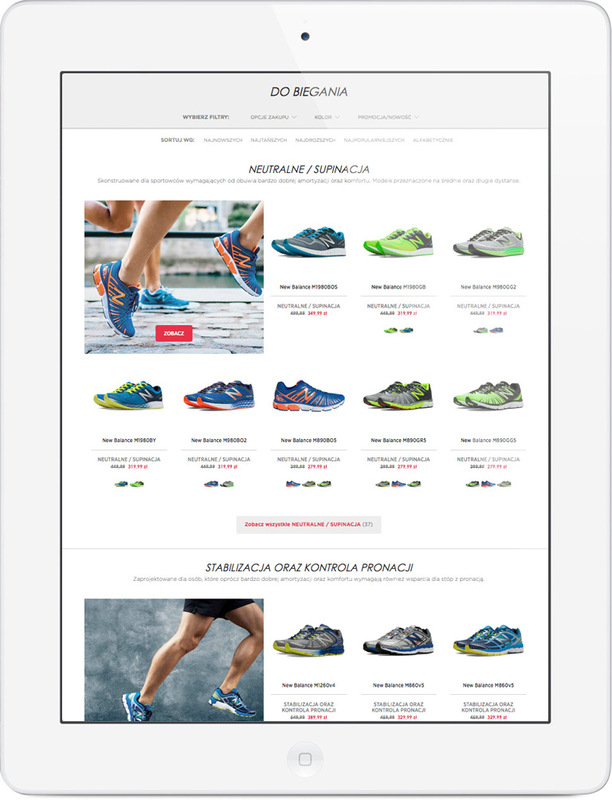 To make it easier for the customers to access the offer, New Balance Poland store was based on the solution enabling to adjust the page to be displayed correctly on any device. To obtain the highest functionality and usability level, the works were based on the mobile first rule. Also other solutions, adapted to the Polish market, were introduced in the new New Balance Poland store. New Balance shoes are characterized by a wide choice of colours. To improve the offer presentation, the products miniatures were used on the product page instead of the standard colour guide. Such a method to present the offer not only facilitates getting acquainted with the products but also improves the visualization of the available colour options. In New Balance Poland store an advanced product size selection module was implemented by introducing two options: size and width. At present, the store is prepared to sell not only the standard European sizes but also shoes in three foot widths: standard one (D), wide (2E) and very wide (4E). 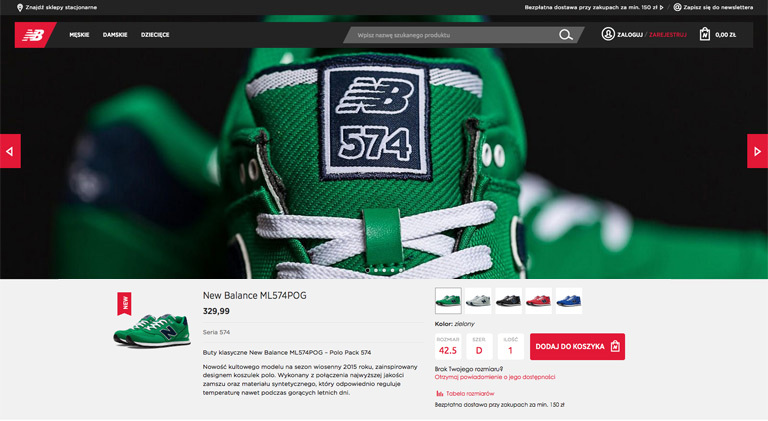 To maximise the facilitation of product search processes, the search engine with graphic hints and hidden categories were used in the new New Balance store. The administrator can ascribe a dedicated name, description, graphic image, or even, for a promotional campaign, an additional, horizontal advertising banner placed directly on the sub-category page. Thanks to that, all the sub-categories can be presented under a single category of products in a clear and simple way. synchronisation of e-shop orders with ERP system. The integration provides continuous access to the up-to-date information and improves the order performance rate. The implementation result is the cutting-edge, fully mobile website with a number of improvements perfectly matching the Polish eCommerce market. This is also interesting graphic solutions and non-standard interaction with the user or clear and simple offer presentation. The next development step entails works aimed at improving the efficiency of the shipment manager. The assumption behind those activities is to ensure full automation of processes and, consequently, improved order performance speed. All that improves the customers’ satisfaction and customer service quality.